"Cambridge Tarragindi Mindi" was born on May 31, 2004 and became a member of the Schuster family in December 2004. Mindi passed away on December 31, 2014. 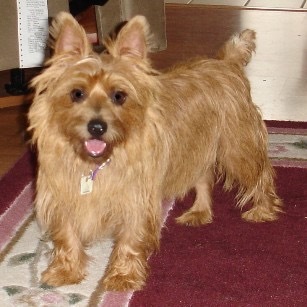 Mindi was a Red Australian Terrier. Mindi's name was derived as follows: "Cambridge" identifies and honors the breeder's kennel name. "Tarragindi" is a suburb of Brisbane, Australia. Mindi's Auntie Helen lived in Tarragindi with her husband and children. "Mindi" was named after the Animaniacs character Mindy Sadlier. This name aptly described at times the personality of our fiesty "little" Australian Terrier girl. Mindi is also an easy name for humans to pronounce and for dogs to recognize. Mindi loved to be the center of attention (and why not ... she's a little beaut!). She loved to get up on our chests and lay her head on our shoulders. Of course she was always up for a good tummy rub and could lay on her back for ages enjoying that simple pleasure. She was a little thief and when the opportunity arouse when she could steal Taz's rawhide chew (of course this was after she had finished hers) she would. She would stalk her prey (chew) like a pro. Mindi loved to be pampered and got excited when she saw the red box containing the grooming brushes. One of her most favorite things to do was to go on walks with her new brother Tex. Click here to go to Mindi’s original webpage.